The tenacious railroad preservationists from the Steam Railroading Institute in Owosso, Michigan are reporting that 36,000 people descended upon the town for the museum’s TrainFestival 2009 – and that’s not counting the many who comprised the museum, vendors, volunteers, or locomotive crews. Facing fluctuating weather forecasts, thousands came in droves to ride a series of all-day excursions between Owosso and Alma, Michigan, and tour the museum grounds as it hosted eight operating steam locomotives, hundreds of vendors, dozens of displays, and an functioning live steam layout. With visitors representing all fifty states and a dozen countries, the event turned Owosso into a historic and economic hot spot in a state whose economy and displaced auto industry has largely governed public perception. TrainFestival gained national notoriety before the gates even opened thanks to the cross-country excursion of Southern Pacific Daylight no. 4449, drawing thousands track side in an endeavor that mirrored the locomotive’s goodwill tour at the head of the American Freedom Train in 1975-1976. In a joint effort, the Daylight’s caretakers Friends of the 4449 and the equally experienced Friends of Milwaukee Road no. 261 chaperoned the 1941 Lima graduate from Portland, Oregon to Owosso in two weeks. 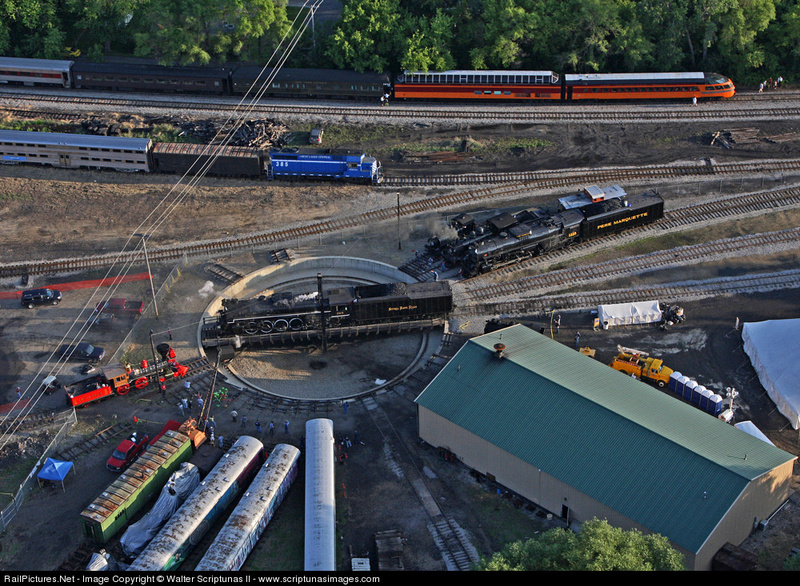 As previously mentioned on SteamCentral, this portion of the festivities would not have been possible if not for the efforts of nearly a half dozen railroads, including Amtrak, BNSF Railway, Canadian National Railway, Canadian Pacific Railway, Great Lakes Central Railroad, METRA, Rail America, and in a last minute series of logistical acrobatics, Norfolk Southern and the Indiana Harbor Belt stepped in to aid in the movement of the locomotive when it was discovered in the 11th hour that no. 4449 would not clear obstacles south of Chicago. Both railroads allowed the ferry move of no. 4449 in a gracious commitment that helped salvage the trip. Alternative and substantially more complicated routes through Indiana (which could have included a joint ferry move with Nickel Plate Road no. 765) were considered but fortunately not utilized. In the months leading up to the festival, SRI had performed substantial work on Pere Marquette Berkshire no. 1225, including an overhaul of the Baker valve gear and test runs with freight trains compliments of Great Lakes Central; all of it topped with the application of a paint job that would color the eyes of Lima Locomotive Works photographers an envious green. In an early morning incident that was quickly and responsibly handled, no. 1225 suffered a tube failure which rendered four tubes unfit for service on July 24th. For all the massive effort put forth by SRI, this unfortunate incident only underscored the importance of no. 1225’s forthcoming overhaul, for which TrainFestival was the massive fund-raising tool. SRI expects the locomotive to be repaired for its series of fall and winter trips, including an October 3rd doubleheader with no. 765 and the consistently sold out North Pole Express. As the dust settles on SRI’s property, the gains made by the organization and the many its many partners are nothing less than extraordinary. Whispers of future events are audible from its young, robust staff of steam saviors, with perhaps an even larger undertaking still many years away.